With ROT & RUIN, Jonathan Maberry kicks off a huge, intense YA zombie series in impressive style. Benny Imura has just turned fifteen, and is looking for a job. Preferably one that lets him kill zombies. He lives in the fenced-in town of Mountainside, somewhere in California. On the other side of that fence lies the great Rot and Ruin, the vast wasteland that used to be America, which is now infested with zombies. Orphaned as a baby by a zombie attack on his parents, Benny is full of rage at the undead, and most other people. But there is no one he hates more than his brother Tom, who Benny believes abandoned their parents to die. As Benny and Tom’s tense, explosive story unfolds, details about First Night — the dreadful night that the zombie plague began — emerge. Right from the beginning, you’re immersed in epic world-building that feels terrifyingly convincing, and thrown into the deep end with complex characters consumed by their secrets and agendas. It’s grim, it’s dark, it’s violent, and it’s full of unflinching truths about humanity. The seamlessly interwoven past and present creates a relentlessly suspenseful and emotionally charged narrative that races to a thrilling and horrifying finale. 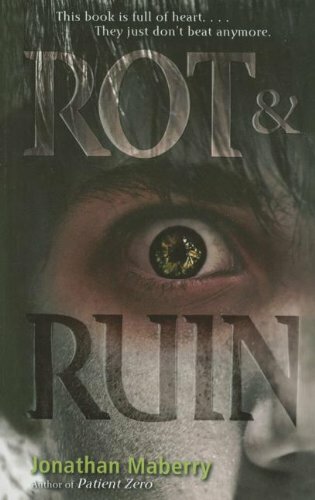 ROT & RUIN is a breathless, brilliant thriller, an exhilarating Robert Cormier-Stephen King level teen-horror hybrid. Maberry has gifted us with a deep and excellent introduction to a vast world that fascinatingly, even with its engrossing, gripping main story, has so much more to explore. Throughout this novel, people are faced with losing their souls; some are strong enough to survive, others are not. It’s powerful, heady stuff that a lesser author could not handle. Maberry’s grasp is rock-steady. He drives his story through character, which makes it all the more fulfilling. With its highly charged emotions and complex relationships, ROT & RUIN is an extraordinary novel, one that demands that you consume the rest of the series like a hungry zombie immediately. This entry was posted in Reviews and tagged Jonathan Maberry, Robert Cormier, Rot & Ruin, Stephen King, YA, Zombies. Bookmark the permalink.